I have just spent an absolutely beautiful week in Venice. It was such a wonderful relaxing holiday, which is something I don’t really tend to do. My holidays have concert performances in them, or consist of visiting many shows in Edinburgh. But this time, whilst we did an awful lot of walking and saw an incredible amount of cool stuff, we also did a lot of resting. Very good idea, and particularly for my reading. It has been a while since I read a book but hours on the beach gave me the chance to get through this classic. I first read Northern Lights (I’m not going to call it The Golden Compass – that is the Americanisation of the name) when I was about sixteen years old. I can remember it being pushed as a children’s book the whole way through my lower school and at the time was on a par with the Harry Potter series. Probably the only thing that has separated them has been a big movie version after Pullman’s first His Dark Materials book adaptation was pretty universally panned. This is a pity, as I remember the books as excellent, and so with a BBC adaptation due relatively soon I thought it would be a good idea to have a reread. The conceit of the book is excellent – set in a somewhat timeless, but probably early twentieth century – alternate version of Oxford, we follow Lyra, an orphaned tearaway, left in the charge of Jordan University. Their world is similar to ours in many ways, but a major difference is that every person is followed by a representation of their soul – a daemon. This daemon takes on the form of an animal and is capable of having conversations with you. 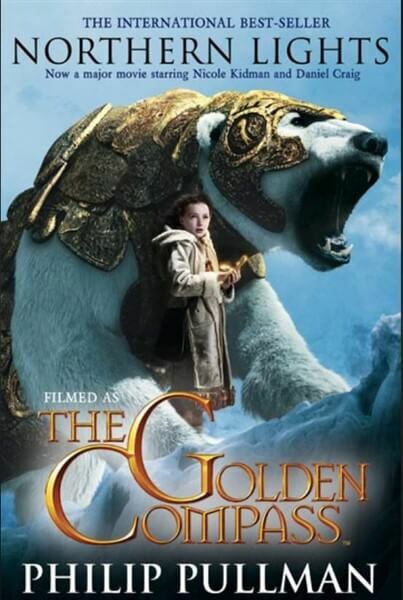 The story is full of twists and turns as Lyra encounters travelling gyptians, armoured polar bears and legions of witches as she tries to discover why there are children disappearing from all over the country courtesy of the mysterious Gobblers. And it is thoroughly charming. Lyra is an incredibly likeable protagonist, with Pullman managing to make her incredibly believable as a young girl, and the myriad of characters all come across as rather well fleshed out, even those who have less time to shine in this book. However, I must say that it was not quite the book I remembered it as. It has that unmistakable feel of being the first book of the series, with the author not able to go full out and get totally lost in what is possible to tell. I have read the two follow ups, and I think I may have been hoping for more because the full tale is excellent, but I can see myself giving higher marks to the follow ups as I reach them. As a side note, I was gripped enough that when reading this at the Lido beach in Venice I got lost in it and got some terrible sunburn. I don’t know whether that deserves to lose it a mark or gain it one, so I shall leave it be. Read another half a book whilst away, so I should have another review up soon. Or have this sentence here as a stark reminder to myself to be less rubbish at reading the mental pile of books that I am sitting on.